The Putney Chapel was built in Stratford, Connecticut. The 1830's and 40's were a time of religious revival and personal improvement in the United States. Religious orators were traveling the country speaking before groups urging them to seek God. Lyceum societies were springing up all over New England for adults to meet and discuss ethical, philosophical, and political issues of the day. In this climate, the people of Oronoque and Putney in Stratford, Connecticut gathered for spiritual and personal betterment. Originally, they held their meetings in alternating schools in the area. In 1843, it was decided that a conference hall (as it was originally called) needed to be built, as hosting meetings in schools had become inconvenient and unsuitable. After some controversy about where to build it (either Oronoque or Putney) it was decided to build it on Main Street, on the corner of what is now Chapel Street, in the Putney section of Stratford. The people of Putney were very excited about the project. The ladies formed sewing societies to earn money; they made gentlemen's shirts and other items that they could sell. The men contributed generous sums of money, labor, timber, and other materials for the foundation, frame, and other parts of the structure. The new building was raised in April of 1844, and covered and completed as far as the exterior was concerned the following summer and fall. The desk and seats were added some months later. The churches in Stratford and the people of Oronoque provided little assistance to the efforts of those in Putney. In fact, there was some opposition to the building of the conference hall. The fear was that all future meetings in which lectures were given might come to be held in the proposed new building. The size of the building at first was planned to be twenty feet by thirty feet, but Mr. Lewis Wells urged very strongly that it be twenty-five feet by thirty-five feet which was adopted. The chapel was built under the "voluntary plan" and not with any formal or informal association determining needs or managing resources. If a repair was needed or upgrade planned someone in the area would simply undertake the necessary project. It continued under such arrangement until 1888 when Mrs. H.H. Northrup, formerly Miss Harriet Hawley, willed a bequest of $300 for the maintenance of the building and service. Finally, after forty-four years it became necessary to establish an association to administer the money. Accordingly, a charter of incorporation was obtained at the January session of the Connecticut Legislature 1889, by which The Putney Chapel Association, David Boothe, Sr. as President, was established. The chapel was used for regular meetings by various societies during its history. The Putney Ladies Sewing Society used the chapel from it's inception in 1844, continuing until 1961. The Lyceum Society also had its monthly meetings there to discuss such issues as "Whether sloth or ambition has created more evil in society". Preachers and orators would come to address the 60 or 70 people the chapel held. Also, a Christmas Eve service was held every year by the people in the surrounding area. As time went by, and traffic increased on Main Street and Chapel Street, a shortcut behind the chapel was gradually enlarged from a footpath to a proper road, leaving the chapel on a small island in the middle of Chapel Street. 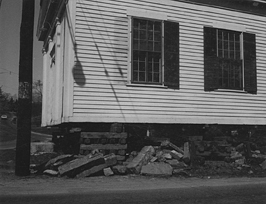 In a time before stop signs, although most people would slow down when coming down the hill on Chapel Street, the location of the chapel became unsuitable for drivers and occupants of the chapel. Finally, after a fatal accident, (local lore is that a drunk driver slammed into the chapel) the chapel was closed and it was decided by the town and the Association to move the chapel to a corner of the Boothe Park Property which the Association would rent for one dollar a year. 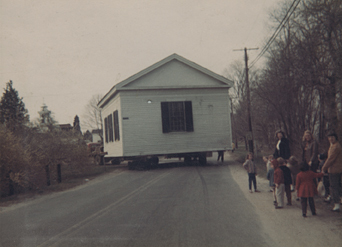 In 1968, the town of Stratford paid $4,800 to jack up the chapel and move it to its present location. An agreement was made with the town that the Association would maintain the inside while the town would maintain the outside. In 1985, after some negotiations with the town to keep up its end of the bargain, the chapel was restored and updated to modern safety specifications so that it could be again used for the original builder's intentions. A few years later an addition on the back, containing restrooms and an office upstairs and a proper kitchen & restrooms downstairs was added. Presently, the chapel is used for meetings by the Friends of Boothe Park Trustees, the Putney Chapel Association (a 130 year old organization), an annual non-denominational Christmas Eve service for residents of the Putney community, and can be rented for baptisms, weddings, and funerals.